A cluster meeting of librarians was held in Dehradun region at Sambhota Tibetan School Paonta on 27 th and 28 th July, 2017. Seven librarians from nearby Tibetan Schools participated in the meeting. On the first day, the Principal of the host school, Ms. Sonam Palkyi welcomed the participants of cluster meeting by introducing the school and the library related activities being carried in their school. Ms Tenzin Legzey, representative of DoE, shed some light on the aims and objectives of the cluster meeting, and the current focus on developing reading habits in children and making the libraries effective to this end. Each librarian made a presentation describing the activities of their school library. Some of them showed the pictures of various library activities in order to show the nature and extent of children’s participation. After the presentations, new ideas were discussed about to make the libraries more effective in inculcating reading habits among children and develop them into a life-long reader. The discussion focussed on specific points such as: how to encourage students to read and write book reviews and their further use of DEAR time (Drop Everything And Read) project. 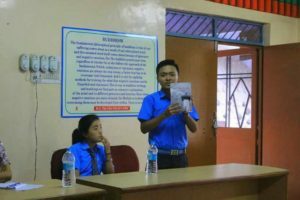 The librarian of STS Paonta organized a presentation by two students on book review done by them. On the second day, discussion was held on different rules and policies of respective school libraries and on the selection criteria for books, newspapers, periodicals and journals formation of committee in school to assist the purchase of new books. In addition to sharing and discussions, a tour was organised to Khenchen Rinchen Library situated in Puruwala, a newly built library which has a large collection of books. The objective of this tour was to learn about the functioning of the library and the management systems. The meeting introduced the librarians to several new ideas which are extremely important to make our children independent readers.